Several sailing centers and sailors from the Northeast are among US Sailing’s 2015 Training and Community Sailing Award winners. 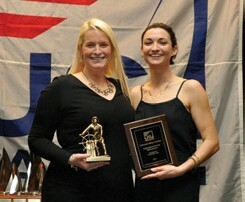 The awards were presented at the National Sailing Programs Symposium (NSPS) in New Orleans, LA in January. Oakcliff Sailing in Oyster Bay, NY received the Captain Joe Prosser Award for Excellence in Sailing Instruction, which is given to an organization that has made an exemplary contribution toward improving the quality and safety in the training or instruction of sailors. Alicia Martorella, Sailing Director at The WaterFront Center, also located in Oyster Bay, NY, was named Outstanding Community Sailing Director for her notable contributions to promote public access sailing in the development and organization of a sailing program. John O’Flaherty, Executive Director of the Community Boating Center in Providence, RI, received the Marty A. Luray Award, which is presented to a deserving recipient who has made an outstanding and unselfish contribution to further public access sailing. He’s created programs that allow children from various socio-economic backgrounds to go sailing for little to no cost. Hallie Payne, the Camp Director and Supervisor of Overnight and Community Sailing at Mystic Seaport in Mystic, CT, received the Excellence in Instruction Award. During her ten years as an instructor and Director, Payne has played a prominent role in the education of more than 6,000 students. The Young Mariners Foundation in Stamford, CT received the Creative Innovations in Programming award, which recognizes programs or individuals who have successfully found new and different methods for teaching sailing. Nantucket Community Sailing in Nantucket, MA received the Outstanding Outreach & Inclusion Award for making notable contributions to promote public access sailing.